These are, hands down, my favorite items in my winter gear box, and I have found them to be a must-have (especially on the heavily used trail systems around Missoula) over the years since I was turned on to them. A pair of these ice fishing cleats can be purchased at Sportsman's Surplus in Missoula for $3.99. And let me tell ya - they saved my hide on the trails today! Skagit, Sonny and I decided to go up Blue Mountain and instead of the slush that was there earlier in the week - we found the trails to be mostly ice covered with the cooler temps that came in overnight. There is a part of the Missoula community that braves the winter, no matter what the weather, to hike up to the top of Mount Sentinel...and almost every time I'm out lately someone asks me about these cleats...either they are wearing Yaktrax or they use trekking poles for stability or they have screws in the bottom of their boots/sneakers. They always seem curious since I am able to run on the slippery slopes in these things...in fact, the other day Kathy and I were running down Sentinel in these and a guy (in Yaktrax) stopped us at the trailhead to ask us about them....and where to get them. There are two drawbacks, as I see it, to these cleats. 1. You need to make sure you step on the ball of your foot and not your heel while stepping on the ice. If you step on your heel (which I have several times, by the way) you may go flying through the air and land on your tailbone...not a pretty sight. It would be great if the designer added one more line of cleats for the heel. 2. Because of the way they are designed your toe is slightly higher than your heel while running. It is perfect for running downhill, but as for uphill your achilles tendon may get a little more stretch! I don't even notice it anymore. The benefits to buying these far outway the drawbacks - starting with the price! 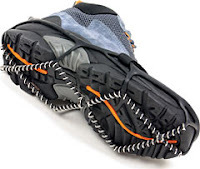 Even if your dog chews one of them up - you can replace them for a fraction of the cost compared to, say, Yaktrax, which are normally $20-$25 pair unless they are on sale. This is what I used to wear in the winter...but they didn't stay on my sneakers very well so I ended up losing more than I care to remember. I had to find something better.